Brandon Rowe '04 is focused on the long road ahead of him as he counts down to the 2008 Olympic Trials. "The good runner thinks only of what is in front of him and, stretching his mind toward the finish line and putting his hope of victory in his feet, does not plot against the fellow next to him or even consider his competitors." â€”Lucian, author and philosopher, 170 A.D.
As part of his training for the 10,000 meter (about 6 miles), he runs approximately 400 miles a month. He completes what he calls an easy run in the morning of 3-5 miles and an afternoon run of 7-13 miles. Rowe has wanted to compete in the Olympics since his junior year of high school. It was then that he realized just how much hard work pays off. Before coming to Haverford and during his first two years on the track team, Rowe says he became discouraged by bad races. 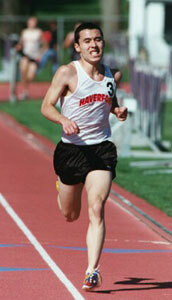 In 2002 at Haverford, he won his first conference race, set the meet record for the 10,000 meter, and got a strong provisional qualifier for the national competition. He credits coach Tom Donnelly as a great source of inspiration. Though it is Donnelly's job to encourage his team, his comments to Rowe are far from empty praise. According to Donnelly, Rowe would have the best chance of making it to the Olympics if he runs the 10,000 meter in less than 29 minutes. To reach that goal, Rowe must shave two minutes from his personal record in that event. Unlike the professional runners who receive sponsorships to assist with training, amateur runners, like Rowe, must find creative ways to balance training and work schedules. Rowe decided to merge his passion for running with his experience as a Web designer. His Web site, www.pennypermile.com, offers a way for people to fund his Olympic aspirationsâ€”a penny per each mile that he runs in training. It also features a running log with daily mileage totals, training synopsis, profiles of his sponsors, and a message board. Since the site's launch on Dec. 5, 2005, Rowe has run 668 miles in 64 days, and has received one sponsor.